We had a swift, wild ride from Majuro to Saipan. It stands out as a passage that was relentless from the time we left Majuro. 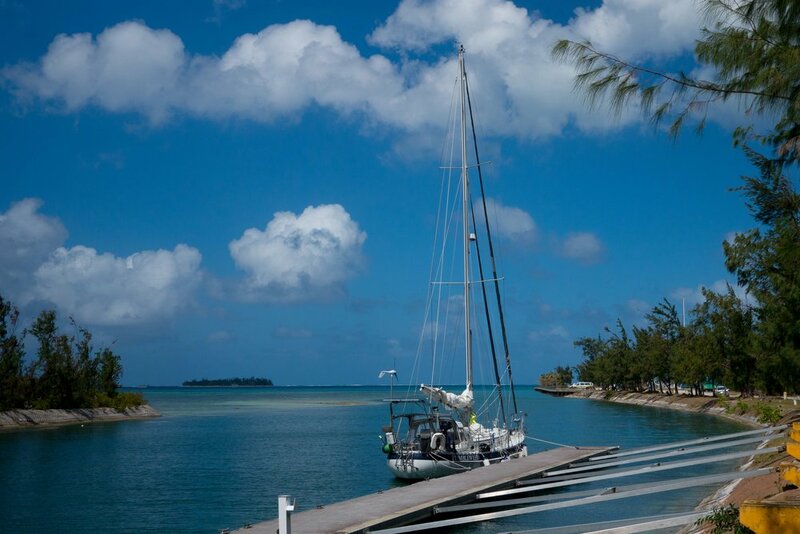 We picked up the trade winds as we came out of the pass at Majuro and rode them all the way to Saipan. It was exhilarating, challenging, tiring, stressful and rewarding. Different from previous passages in that it was non-stop challenging sailing for the whole passage, usually there are a couple of down days, or the winds might ease for half a day, we’ve always had some time to catch our breath, organize down below a bit, clean up, etc but on this passage once we left Majuro we sailed with 20 plus knot winds the whole way, often in patches with 30 knot winds gusting into the 40’s. We were mostly on a broad or beam reach which was good, with two wave trains that were mostly comfortable but we had some strong collisions with the odd combined large wave. Saipan has been an excellent place to recharge and regroup after our passage from Majuro. After checking in we were able to get a slip at the Smiley Cove Marina, a nice surprise after reading on Noonsite that the marina did not accept transient yachts. Watching the waters in the lagoon this past week I think we’d be miserable if we’d have had to anchor out there. There have been large white caps and steady winds in the 20’s all week. Very happy to be in the marina. People have been friendly, the harbor is really well marked, there is a US military presence in the area and the US Coast Guard maintains the channel markers so our arrival was easy. We had constant radio contact with harbor control who were professional and helpful, guiding us to an anchorage near the dock where we would need to clear in. Douglas after we’d settled in at Smiley’s Cove Marina. A note to future visitors, we were asked to clear in at “C” dock which is the large dock that accepts cargo vessels. It was near low tide and with our low free board we would have lined up just below the massive rubber bumpers installed along the concrete. With the waves and wind I think we would have wedged under the rubber and could have done damage to the toe rail, stanchions, etc. We asked if we could return at high tide but the port was able to accommodate us in their small harbor that fronts their offices. It was sheltered and is scaled to smaller boats, much better for everyone. Our contact at the port organized all the various departments for clearing in and all went well. We had to pay $150 for the health certificate which seems steep, they don’t differentiate between yachts and commercial vessels. The entrance to the marina is very narrow, there is a peninsula that juts into the lagoon with a channel to the marina on the south side marked with a lone red buoy. We hugged close to the marker as advised, to starboard on entry the reef is close and very shallow. We arrived about halfway to low tide and saw depths of 8 feet in the fairway. The entry is narrow and shallow, worth taking a look before making an approach. With the NE trades blowing we were sheltered once we rounded the buoy and that helped immensely. At the slip we touched bottom at the day’s low/low tide with our 6 foot draft. There was a bit more depth in the inner marina. We used a handheld depth finder and checked out various slips, not all would have been deep enough for us, they need to do some dredging, maybe they silted up after Typhoon Yutu. This gives a better sense of the entrance to Smiley’s Cove. Most of the water to the left is very shallow reef, the entrance into the cove hugs along the concrete embankment to the right. Two days ago we moved from the outer slip into the marina proper, a small collection of slips designed mostly for small pleasure boats that travel around the lagoon. There are a couple boats that are offshore capable but there are no cruising yachts. For the first several days we were on the outer dock mostly by our selves and something of an attraction. Several times we glanced out to see tourists posing next to us, Once a group was kneeling on the dock for a group photo. It is the first time since we left Port Townsend that we have not been part of a cruising community. Every place we’ve visited has had at least a couple of other boats that are heading offshore or in some sort of cruising mode. We’ve been told that only 5 or 6 sailboats visit a year and it’s understandable, the small marina here is not set up for cruising yachts, their rules allow for up to two weeks to visit and only allow live aboard at the outer slip. When we were at the outer slip we would touch bottom at the daily low-low tide with our six foot draft. We were able to get a slip at the inner marina only because of the threat of heavy winds from Typhoon Wutip. The waters of the lagoon are beautiful and there are many nice beaches for swimming around the island. This area is where US forces came ashore in the battle for Saipan. There are remains of Japanese bunkers along the shore. 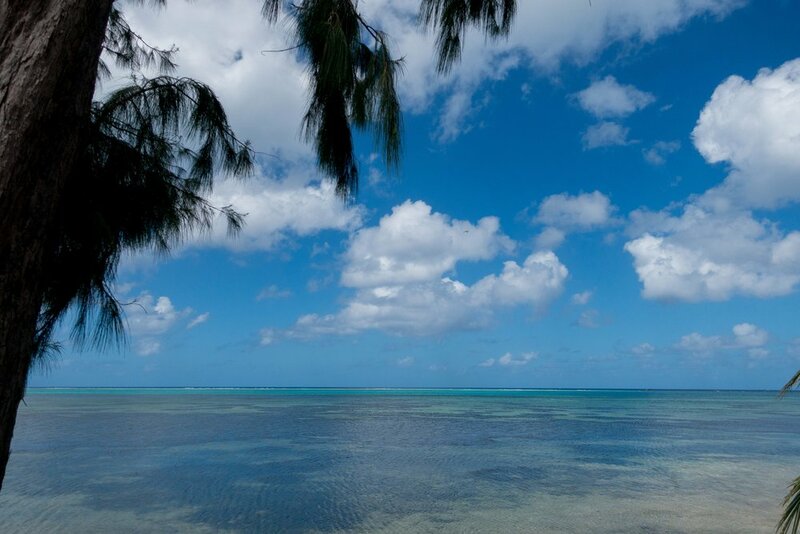 Saipan has beautiful beaches and the lagoon is a gorgeous turquoise. People are friendly with a healthy laid back island vibe. Although the island was extensively damaged by hurricane Yutu in October the area with most of the hotels and tourist activities near the marina are up and running and the damaged buildings have been cleaned up a bit. The worst of the damage appears to have been at the southern end of the island and the damage there was like nothing I’ve seen before. Whole buildings imploded, houses with roofs torn off, resorts torn apart. There is not much of a yacht community here but the people with boats in the marina have been really friendly and taken us out for meals and have taken us sightseeing around the island. 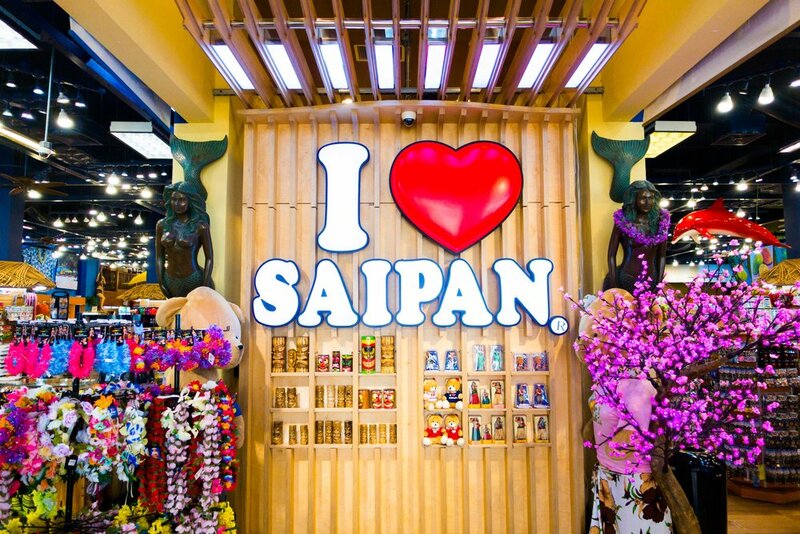 There is a generosity of spirit that I like, the overall vibe of Saipan is positive. Local flash the hang loose sign when we wave from the boat, people take time to help us out when they can. We found a solid thai restaurant a short walk from the marina and a friend of a friend who lives on the island turned us on to a terrific Japanese restaurant. One of the big surprises were the large hotels along the beach as we made our approach to the island. We had no idea that so many tourists visited Saipan. We’ve heard that 700,000-800,000 tourists visit each year. Most coming from Korea, followed by China, then a few other countries and then Japan, which used to be the source of most tourists. We are only a 4 hour flight from Tokyo (I’ll think of that while we make our way north). Once we arrived in Saipan we organized Tumbleweed and were just starting to unwind when news of a tropical storm building and heading our way started to make the news. For several days we followed the storm as it was forecast to swing over Saipan, then built to a typhoon, then a named typhoon, Wutip, and finally as it passed south of Guam and made its way to the NW of Saipan. During that time we applied for a typhoon slip in the inner harbor and followed all the updates relating to the system. We never got to the stage where we had to go into full on typhoon prep mode, like hauling down the sails, etc, but we were anxious for a few days. Particularly after seeing the damage done by the hurricane Yutu that swept past here only a few months ago. February is supposed to be the safe month to visit the Northern Marianas, it is very rare to have a typhoon hit in this month, but with the oceans warming we’ll be seeing more and more storms throughout the year. The warm waters are basically the fuel that feeds the storms and as Wutip passes Saipan it will be entering cooling waters and dying. Once the system passes us there is a benefit we hope to take advantage of, the winds will switch from the NE trades to coming from the SW. Our plan is to use those winds to get us up through the Marianas to Pagan and to Maug where we will wait for a weather window to sail the last leg to Chichi Jima. The history of the island during WW2 is pretty grim. The fighting to take Saipan was among the worst in the pacific. Three thousand Americans died on Saipan with 13,000 wounded. At least 27000 Japanese soldiers were killed. 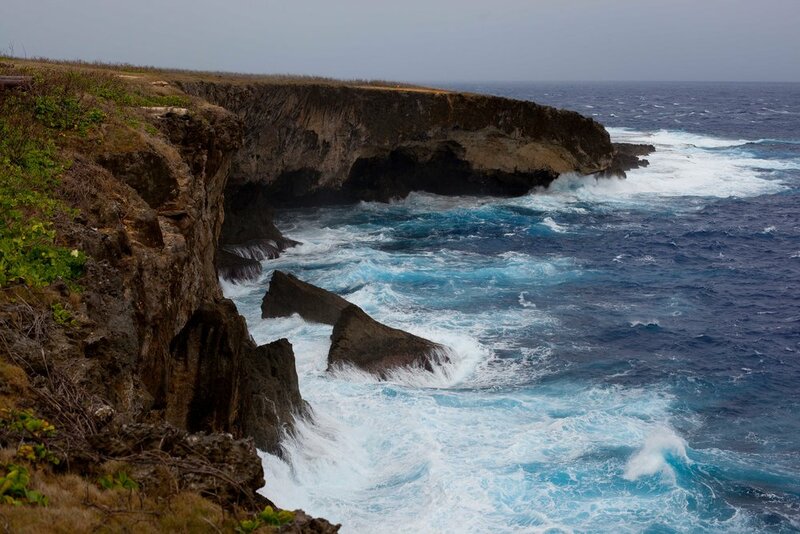 One of the great tragedies of the battle for Saipan was that thousands of Japanese civilians committed suicide by jumping off cliffs rather than be captured by US forces. They had been convinced by Japanese authorities that the Americans would treat them savagely. The cliffs at the north end of the island now have several memorials to the civilians who jumped to their deaths, often with their children. We have a good weather window to follow in the path of Typhoon Wutip and will most likely head out tomorrow. This is a bit of a rushed post, wanted to get out a few words on Saipan and post the notes from our passage. We’ve had a great visit to Saipan and are looking forward to visiting Maug island on our way to Chichi Jima. Below are the updates we submitted to Farkwar during our last passage, little notes on the conditions as we made our passage from Majuro to Saipan. It feels good to be back at sea, on passage, sailing to Saipan after 6 weeks visiting Majuro. We cleared out Friday and sailed to Anemwonet where there are several nice moorings. 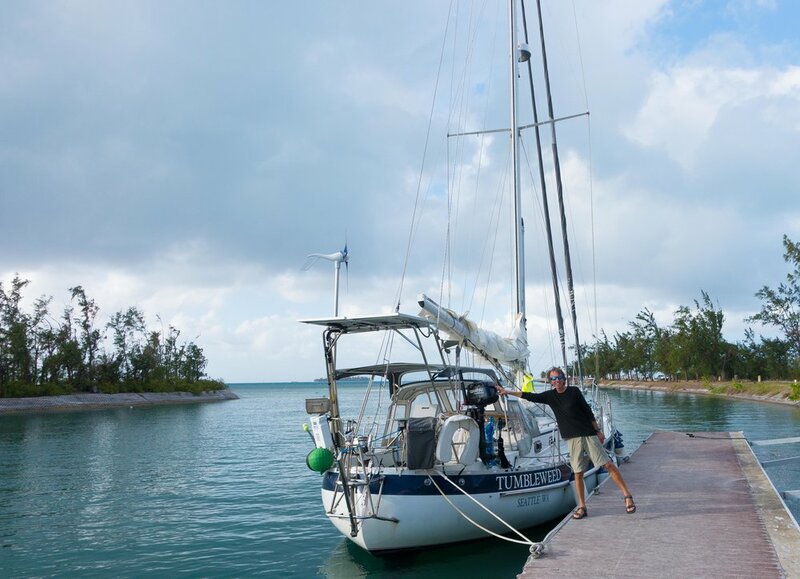 We scrubbed the dinghy, put Tumbleweed into passage mode and enjoy a couple quiet nights before departing yesterday. We are in the NE trades the blow consistently across Majuro and on to Saipan. So far the winds have been consistently in the 20 knot range, something dipping into the teens, and sometimes running up into the higher 20's but it's been consistent without squalls or major changes. Seas are uniform and moderate with an occasional good smack, this is wonderful blue water sailing. Forecast is for these sort of conditions to Saipan. The full passage is about 1500 miles. Last night we had another encounter with a fishing vessel, this one had lights and we could see it from miles away, but no AIS and continually changed direction until it lay across our path, we tacked south to get clear of it and it came to a stop. Our attempts to communicate were fruitless. Kind of a mad 1am scramble but we are learning to be wary of fishing vessels and try to give them as much space as possible. Points for using light! All is well on Tumbleweed. Getting settled into passage mode. We had 146 miles of excellent sailing in the past 24 hours. We passed the island of Kwajalein last night, at first a very dim glow on the horizon that grew to twin bright orbs off to starboard for several hours. No missiles incoming or directives issued from the military, seemed pretty calm over there. We were hit with several sneaker waves yesterday, we would get these perfect combinations of wind and sea that would twist us quickly into the seas putting us beam to just as a large wave smacked us, I was doused with a good bucket of water twice. Once when I was over confident in the uniformity of the seas and had a portlight open below - it was like someone outside had taken a bucket and tossed it neatly through the portlight right at my head. The other times were in the cockpit, with no warning we'd head up just as a wave came crashing aboard. Since passing Kwajalein the seas have settled considerably but we still have decent winds. Making 6 knots, COG 270. All is well on Tumbleweed. A good day of sailing to report. We passed two small atolls last night and our next waypoint is Saipan, 1200 miles to the west. Excellent conditions and comfortable sailing, double reefed genoa and stays'l, making 6.7 knots at the moment, COG 281. It feels a bit cooler than Majuro and we are each able to get good sleep in the off watch. 84 degrees in the cabin at the moment, it was mostly in the 90's when in Majuro so this feels pleasant. All is well on Tumbleweed. An hour after extolling the glorious, perfect sailing we were having we began to be run over by ninja squalls. At a distance they looked like the weakest of rain clouds, something that would drift over us with a gentle wash of a few rain drops, instead they would crash into us with gusts over 40 knots, causing us to round up and accelerate for a few thrilling minutes. These bookended our lunch break causing us to eat quickly with an eye to the NE as a disarmingly light grey cloud made its way to us crashing into us like a gleeful bumper car, dumping rain and sending us running off downwind. That has been our excitement of the day. The first hit late morning and the winds had dropped into the high teens, we were contemplating taking out the two reefs we have in the Genoa just as the first hit, glad we stayed reefed down. Sometimes I believe Neptune is listening and has a bit of humor... We are now running with a current giving us a one knot boost that should continue most of the way to Saipan. A free 24 knots a day! Who says there is no free ride? We have spent the morning cruising along near 8 knots, comfortably. Yesterday was a 150 mile day under double reefed genoa and stays'l, heading is 282 degrees, speed over ground is currently 7.2 knots, distance to Saipan is 1012 miles. All is well on board Tumbleweed. In the past 24 hours we had a run of 148 miles, making good speed with the benefit of the current and strong winds. The weather continues to move through various cycles, we'll have patches of bigger seas, as we are in at the moment, then hours of more settled seas. Squalls materialize quickly, with gusts into the 30s and a good dousing of rain. We will soon cross the halfway point. Currently 963 miles to go, COG 275, making 7.5 knots at the moment, but that tends to fluctuate, we've had periods in the 5 knot range as well that pull our average down. We continue to sail under a double reefed genoa and stays'l. The times the winds dip down into the teens are short lived and when the squalls hit we are glad to be reefed and ready to run off. All is well on Tumbleweed. Day Seven. We made 136 miles yesterday through volatile seas and a handful of squalls, the excitement level of this passage has dramatically moved up. Once again the night brought bouts of heavy winds north 30 knots sustained, with gusts into the 40s, several rain showers, then clearing of the night skies. Yesterday was a mix of a rain, cloudy skies and high winds followed by a clear sky with winds in the high teens in the late afternoon. All this keeps us on our toes trying to guess the best sail configuration. Last night we kept it conservative with the stays'l and trys'l, this morning the winds dipped again and we unfurled the double reefed Genoa. Making good time at the moment, the sun is out and it is shaping up to be a good day. 580 miles to Saipan on a heading of 288 degrees. All is well on Tumbleweed. Day Eight. 160 miles made good yesterday, quite the day. Mostly good weather with strong winds in the mid-20s and organized seas. Last night on watch I was admiring the night sky and checked the radar for squalls, all looked clear and I went back to reading. A few minutes later we were hit by a strong squall that appeared suddenly. Winds so strong I was pinned to the leeward cockpit seat for a few moments, it was a struggle to get to the helm and try to get so to fall off the wind. For several moments the winds were screaming and the lee rail was buried, water rushing back into the cockpit. Douglas was immediately awake and on deck to lend a hand. A big adrenaline rush for us both as we worked to take in the Double reefed Genoa. I saw winds of 35 knots and the gusts were larger. We were hit again an hour later but I was able to get to the helm quickly and with only a stays'l and trys'l flying it was much more manageable. Douglas reports several more squalls on his watch this morning. They are strange in that they materialize, hit us, then move off to disappear. Otherwise, a pretty typical day out here, feeling good about our mileage and looking forward to Saipan. 423 miles remaining, heading 280 degrees. All is well on Tumbleweed. Day Nine. 138 miles made good in the last 24 hours. We often talk about how the highs out here are pretty high, and that the lows can be a real drop off the emotional cliff. On night watch with good conditions, the night sky open above and moonlight silvering the seas around us it feels like we are riding a magic carpet, Tumbleweed bucks and slides, is hit by a large wave, slews off a wave, comes back up and charges forward. I can spend hours enjoying that performance, it is thrilling and what makes sailing offshore so appealing. These NE Trades we've been riding since we left Majuro have made for some of the swiftest sailing we've had, day in and day out just charging along. If our speed drops below 6 knots it isn't for long. Tumbleweed is so solid in these conditions, we hold on tightly and do our best to keep sails trimmed and properly reefed and enjoy the ride. The emotional lows out here are compounded by feeling so distant from shore, and realizing that whatever is happening at the moment must be dealt with and worked through at that moment. There is not time out to walk down to the local coffee shop for a breather, or to step into the next room to ignore when something is heading south. When you pop open a hatch, for just a moment, in what seems like fine weather, when you haven't seen a wave crash over the boat for hours, and yet when just at that moment with tortillas on the stove and lunch about to be served, a massive wave crashes aboard and a couple gallons work through the hatch, onto your head, all over the stove dripping down and flooding the galley sole, it might give one pause for a moment or so to reconsider this whole sailing thing. But after the salt water has been sponged up, clothes changed, lunch reset, sitting in the cockpit enjoying lunch a game of backgammon, emotions level out and it's easy to once again see the magic of the experience. 272 miles remaining to Saipan, heading of 297. All is well on Tumbleweed. Day Ten. Trying to make our way north, stealing back a few degrees by sailing to weather in rough seas has made for a pretty bumpy ride this morning, our daily run dropped to 141 miles and we spent several hours bashing hard into the waves. We have fallen off a few points to the south of Tinian and plan to work our way up to Saipan's harbor from the shelter of the islands. A Thursday arrival is looking far less likely though Friday is looking good. Valentine's Day at sea! What could be more romantic? Temperature in the cabin has dropped to 81 degrees this morning and I wore a long sleeve shirt on watch last night, feels good to have it a little cooler. 172 miles remaining. All is well on Tumbleweed. Day Eleven. An epic day to end an epic passage. After 10 days of full throttle sailing in the NE trades we rounded Tinian island to the south of Saipan in hopes of finding shelter in the lee of the two islands on our way to the harbor. That was not to be and we spent 9 hours tacking our way up the west side of the islands arriving to Saipan harbor just as the sun set in a glorious display. We might have made more tacks and sail changes yesterday than we have done since we left Opua. Saipan harbor is pretty dialed, excellent markings and top notch harbor staff who were in constant contact. They directed us to a fine anchorage with no other vessels nearby where we dropped the hook at 19:30 and set well in muddy bottom. We had pasta with a walnut sauce and dried peas for dinner, with a cabbage salad of course. This was a passage for the books, we've never had such a full throttle set of continuous days, in such big seas. Tumbleweed was great and though we took on some water through various events and small leaks everything else held together surpassingly well, a testament to how strongly built and well designed the Valiants are. Check in was smooth and professional, Douglas walked to the Marina and we are hoping to find a berth there for the next couple of weeks. All is well on Tumbleweed.